The book of Psalms is the prayer book of the Bible. Found in the Old Testament, the Psalms are a collection of 150 songs drawn from the experience of life. Through good times and bad, trouble and turmoil or celebration and contentment, the Psalms give voice to the cries of our hearts. Forget any idea that these are sweet or cute songs, these are not prayers for 'nice people' but personal, authentic and often brutally honest. These songs are prayers which enable us to bring everything in our lives before a God who loves us. 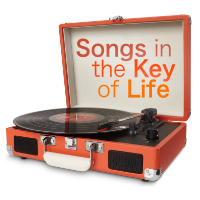 Through this series our hope is that as a church we will develop a deeper life of prayer and allow our hearts to sing "Songs in the Key of Life". Do you wish you prayed more often? Prayed better? Prayed more consistently? You're not alone. This year, we're setting out to change our prayer lives for the better. Not just because it's apparently a good thing to do, but because we know that a life closer to God means a life more fulfilled. Looking at and meditating on Psalm 1, our series opener sets out the motivation for the weeks ahead. For the music clip "Christ the Apple Tree", click here. It can comes as surprise when trouble invades our life or we experience loss, pain or anxiety. How do we deal with this sense of disorientation? How do we pray when we experience "the rawness of life"? The Psalms give us abrasive, revolutionary and authentic words for the cry of our heart. In this talk Nick looks at how we pray when we experience loss, anxiety and pain. With special guest Chris Darlington. For the video clip from "12 years a slave", visit here. Who are you to pray? Who are you to talk to God? Psalm 8 gives us some perspective as to our place in the cosmos and who we are in relationship to God. In this talk, Nick explains how this psalm gives us some perspective in prayer. As the fog of disorientation lifts and the sunlight streams down we see who we are and how prayer always starts with knowing who God is. For the video clip referred to in this talk visit here. ﻿﻿If you could choose a soundtrack for your life, what would it be? For Jesus and his disciples the Psalms were the soundtrack of their life. The Psalms show us how to pray out in words (spoken or written) our deepest hurts and longings, our struggles that leave us anxious or angry, our confessions of guilt, and our joyful thanks and praise so that we share all of our life experiences with our God who listens and responds.In this talk Nick looks at how we can pray the psalms on a regular basis. For many of us, the journey of following Jesus is not the ‘skipping into the soft-focus, sun-shiny distance through fields of daisies and butterflies’ but an often brutal, desolate, hard stumble into darkness. In this talk, Nick looks at the most awful psalm, Psalm 88. How do we pray when life causes us to despair? When we feel abandoned? When we are engulfed in darkness...? "What is the chief end (the purpose) of man? The chief end of man is to glorify God and enjoy Him forever." What do we celebrate in society? What do we applaud? What do you celebrate or applaud? What do you worship? Whatever it is that you enjoy, you praise. We need to understand what it means to enjoy God, and then to let out our praises for Him, for all around us to hear. How often do we feel insecure in our lives? Do we rely on things such as jobs, money or status to try and compensate for this feeling? Why does it often seem that bad things happen to good people, while bad people appear to prosper? We are constantly faced with the reality of injustice – from a global scale right down to the lives of ourselves and the people around us. Susy Ndaruhutse looks at Psalm 73 in order to see what God’s response to injustice is, and how as Christians we can grapple with the ‘wrongs’ of the world. She explores how knowing God’s presence can enable us to trust in the bigger picture of His plan. We love and long to be known. To be known is to be loved. On this Mothering Sunday, Nick looks at Psalm 139 and what it means to be known completely and intimately by God. And how we can pray knowing that we are known and loved by God. Death is a fact we all must face at some point, yet how can we deal with the reality of this? Do we ignore it, or face it head on? In focussing on Psalm 116, Nick Sutton explores what it means to live a life knowing that in following Jesus, resurrection awaits after death. He asks: how can we 'walk in the land of the living' instead of in the shadow and pain of death?